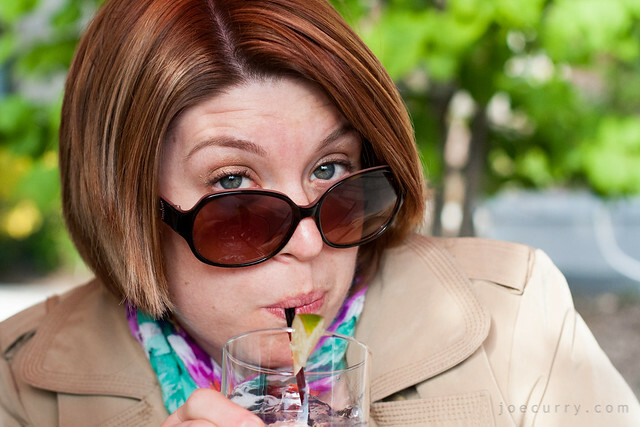 My friend Heidi humored me at happy hour with a photo. 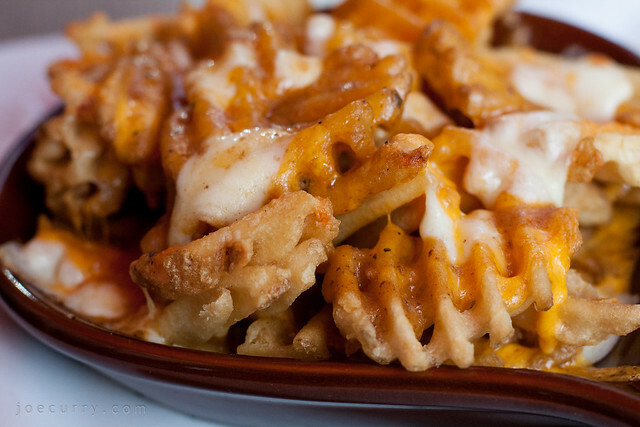 We also tried the Canadian specialty, poutine, a combination of fries, cheese curds and gravy. Not for the faint of heart. Friday night was an exploration of Nordeast Minneapolis, a neighborhood that feels hipster, eclectic and fun. In some ways, it reminds me of Wicker Park in Chicago. (Oh Piece, I miss you.) With a good balance of restaurants and bars that have anchored the community for years, there are also new arrivals like The Anchor Fish & Chips. Or recently new (2009), if you’re fact checking my blog. The wait time for a spot in the 36-seat restaurant? 60-90 minutes. So my friend Ben and I headed to the nearby 331 Club for drinks, where I tried a Surly Bender and Bell’s Amber Ale. It was trivia night with a fair amount of Dr. Seuss trivia in celebration of his birthdate. I’d been Dr. Seuss rhyming for work last week for Read Across America, but that didn’t help me here. We ambled back to The Anchor, grabbed two seats at the bar counter and ordered the main feature, fish and chips, with a side of mushy peas. Mushy peas, you may ask with a wrinkled nose? I like peas (frozen, not canned) but was skeptical, too. It was more like buttered mashed potatoes, but with peas, and actually tasty. The cod fish was great, though the handcut fries did not seem exactly award-winning to me. (Then again, I have a strong bias for McDonald’s fries.) 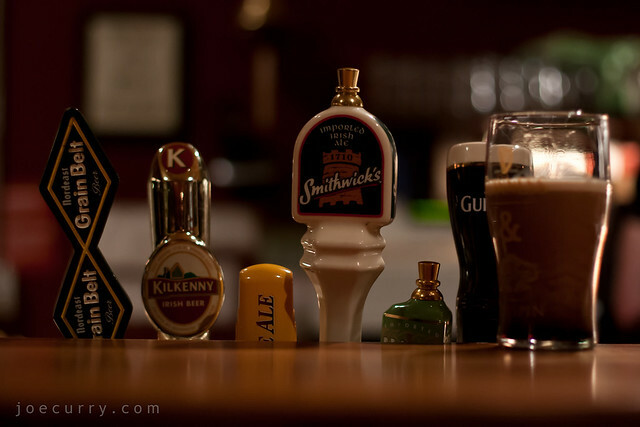 Paired with a pint of Smithwick’s, it was a satisfying meal. This recipe is proof you should pre-test your recipes before inviting company over. Or, that your multiplication factors were off. Or that you should read the ingredients list more carefully. Let’s just say last week’s version was not fit for photos. I rewarded myself for my blogging efforts this week with a new camera lens, to take better low light photos, food photography and portraits. Food photography is challenging, and even more so when you’re under pressure to finish, so your guests can eat! These pretzel nuggets go great with beer. And fortunately, after hosting a second happy hour in less than a week, I now have room to stock actual groceries in my fridge. Preheat oven to 375 degrees. Mix honey mustard and eggs in a small bowl. Season chicken with salt and pepper and marinate in the mustard-egg mixture for 5 minutes. To crush the pretzels, use a rolling pin over a Ziploc bag. 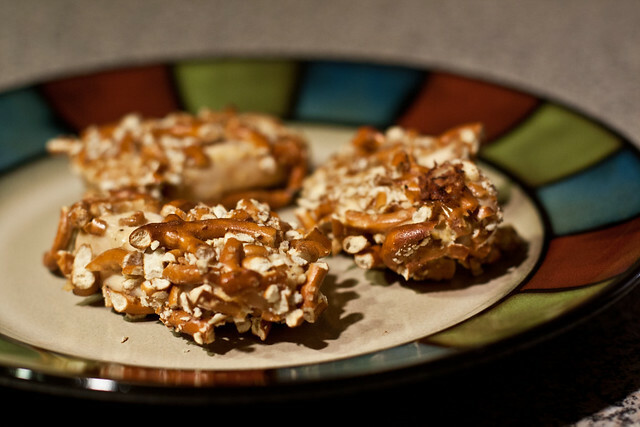 Mix crushed pretzels with sugar and spread mixture on a plate. Spray the baking sheet with nonstick spray. Coat the chicken with the pretzel mixture and then transfer to the baking sheet. Mist the tops of the strips with nonstick spray. Bake for about 10 minutes, flip chicken and bake another 10 minutes or until cooked through. TGIT is not quite the same as in grad school, when no class Friday’s were the norm. Nonetheless, some coworkers and I celebrated with beer, wine, wontons (recipe below) and fun conversation at Joe’s Loring Kitchen. Today was a reflection in habits, as this past Monday we began our Team Fitness Challenge in the office. I’m determined to re-establish my fitness routine, and I have 10 team members to hold me accountable. Some free advice: workouts are best done before happy hour. But hey, I still got in a 4.5 mile run! Cook and drain sausage. Mix ingredients. 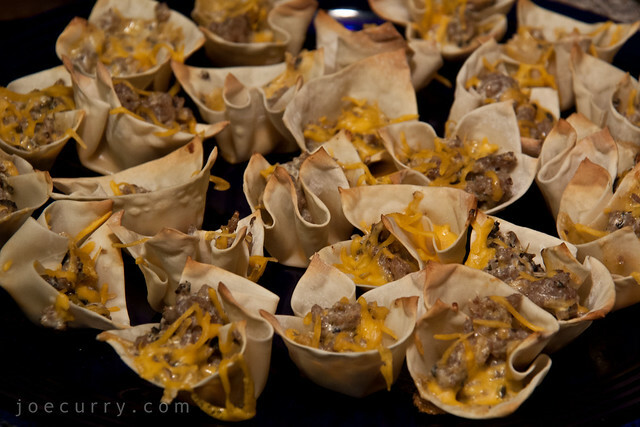 Put wontons in a sprayed mini muffin tin. Bake at 350 for 5 minutes. Fill the wontons with mixture and bake 8 minutes. My parents visited Minneapolis this weekend, and I’d been promising my uncle we’d make paella. So the timing was right for a paella party, and I had special Bomba rice and saffron I bought in Spain last year. My Spanish host family would eat paella every Sunday in the summer of 2001. The recipe comes close to those family dinners, but is not nearly as effortless. I’ve only made this four times in 10 years, and the last time was during grad school in 2006 when I hosted dinner for 17 people. I’m pretty sure we ate from paper plates and drank wine from Solo cups because in grad school, no one’s judging. And my California friend opened her first box of Franzia (for sangria)–puncturing the wine pouch with a scissors an inch from the nozzle. But, that’s another story! Boil the shrimp and calamari in water in one pan. Scrub the clams and mussels and boil in a separate pan. Dice the chicken into cubes and boil in water in large pan. Add a bundle of parsley tied with a string, the chopped onion, and a 2-3 teeth of garlic to the pan with chicken. Cut the pork into strips and cook in a small frying pan with a 1/2 can of tomato sauce. Cut the pepperoni into 1/4 inch slices and brown in a pan. Save the juice to add to the rice mixture later. After all the meat and rice are cooked, add it a roaster pan. Decoratively place the shellfish in the pan, and add the frozen peas, pimentos, and green olives. Bake uncovered at 350 degrees in the oven, until the dish is warmed. Spritz with water periodically to keep the dish from drying out. 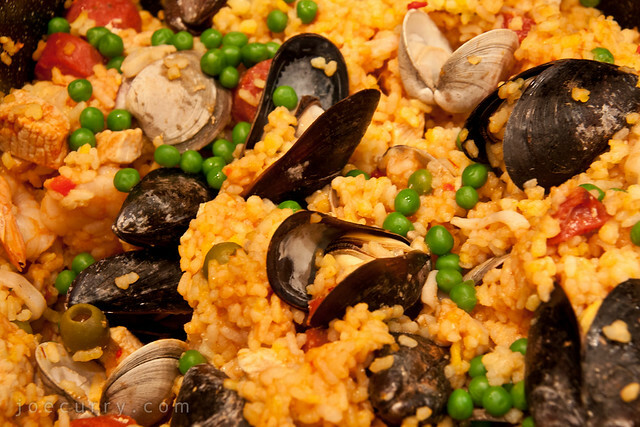 After serving the dish, squeeze lemon juice on top of the paella. Season with garlic salt, if desired. Spanish food is generally not very spicy, but you may wish to spice it up according to your taste. I enjoy testing my culinary skills in the kitchen, and I like entertaining. 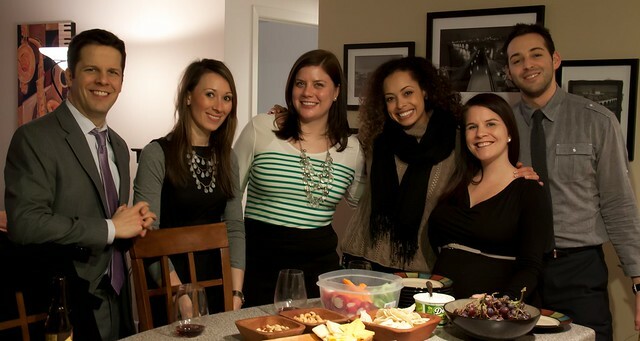 So, I was surprised last night to realize my last dinner party was in September 2010–holy smokes! My menu included an assortment of appetizers (almonds, cashews, grapes, cheeses, crackers, spinach dip and salt & black pepper chips), romaine salad with carrots, walnuts & Craisins, and the main course: three roasted chickens with carrots and salt-crusted baked potatoes. One of my dinner hosting rules of thumb is to delight with dessert. Because if all else fails, your guests won’t desert you before dessert. Here’s the recipe for Key Lime Shooters for your next party. Dissolve Jello in boiling water. Whisk in yogurt with wooden spoon. Fold in thawed Cool Whip. Refrigerate overnight or at least 2 hours. Crumble the graham cracker pie crust in a Ziploc bag to use in assembling your shooters. 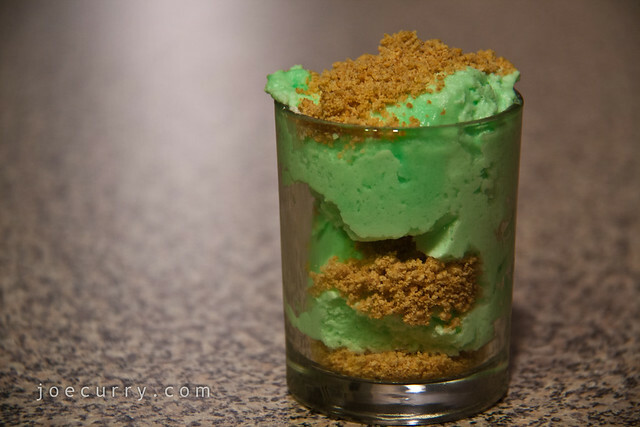 Using shooter glasses (votive candle holders found at your local hobby store), add a spoonful of graham cracker crumbles for your base, layer some key lime filling, repeat and then top with graham cracker or dollop of whipped cream. Enjoy! Another variation: chocolate fudge pudding and crushed Oreos. Sopa was on the minds of many today, as evidenced by the Internet blackout of popular websites in response to SOPA (Stop Online Piracy Act) and the discussion storms throughout the Net. If you never noticed, then I guess you didn’t have 37 Wikipedia searches that wouldn’t work. Sopa was on many Minnesotan minds, as evidenced by the empty shelves of saltine crackers. The bitter cold is back. 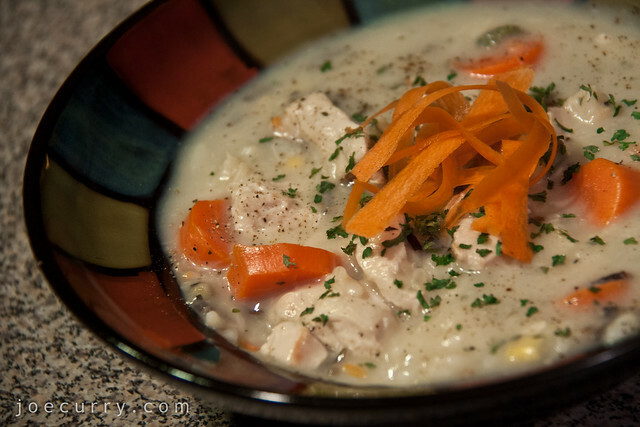 So, I made chicken wild rice soup. Not homemade by definition, but homemade enough (add-in ingredients) that it still makes you feel good. * For the record, soap = jabón in Spanish. Beginner’s mistake!